Location: UVa Law School, Caplin Pavilion. Time: Wednesday, October 9, starting at 9:45. Like Us on Facebook: Event page. UVa School of Law: visit the law school event page. At this point, it is unlikely that Congress will pass comprehensive climate change legislation in the near future, leaving President Obama with only the executive powers to curtail greenhouse gases and facilitate adaptation to climate change impacts. The Virginia Environmental Law Journal is bringing together some of the country’s leading experts on climate change law to discuss the implications of a purely executive approach as well as propose avenues for change. 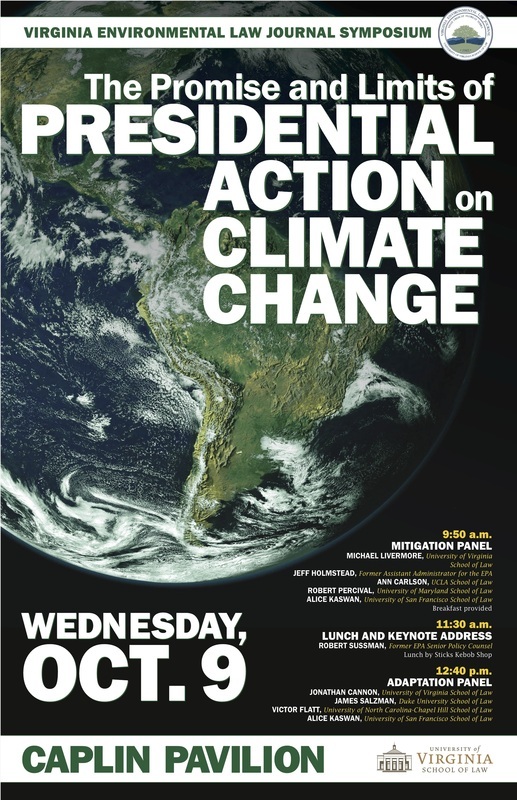 The symposium will examine executive actions that can be taken to reduce pollution, prepare communities for the consequences of climate change, and speed the transition to more sustainable sources of energy. It will also address the pitfalls of a purely executive approach. Participants include a former Senior Policy Counsel for the Environmental Protection Agency, a former Assistant Administrator for EPA, and members of legal academia.